The side-splitting sequel to The Color of Magic, The Light Fantastic by New York Times bestselling author Sir Terry Pratchett takes readers on another offbeat journey with bumbling wizard Rincewind and hapless tourist Twoflower—both last seen falling off the edge of Discworld. The fate of Pratchett’s alternative fantasy macrocosm are in the bumbling duo’s hands as it hurtles its way toward a foreboding red star, threatening the fate of the entire universe. 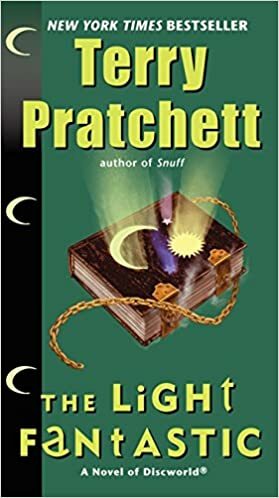 Sharp, sardonic, and brilliantly funny, in this third installment in the bestselling Discworld series, Pratchett once again earns his master satirist reputation, with witty wordplay and irreverent storytelling that fans are sure to love.